Join us to celebrate five years of Blackhawk Winery! We are sooooo excited to be able to celebrate with all our fans! We'll have cake throughout the day along with music in the afternoon with Jazz Elements Trio and music in the evening with The Mulligans. This will also kick off our summer concert series - free summer concerts on Saturday nights all summer! We will have pizza available for purchase but feel free to bring your own food and enjoy an afternoon or evening picnic on the lawn - or both! 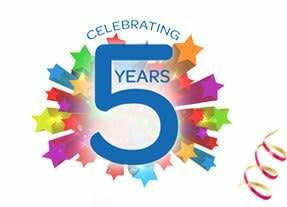 Big thank you to everyone for helping us make it to FIVE years! !